One of the most challenging aspects of managing a repository is to raise the visibility of repository services in order to ensure researchers are contributing their research outputs. In our recent survey of COAR members, “engaging with the research community” was rated as the top major challenge for respondents. To address this issue, COAR will be undertaking a number of activities to document effective practices for repository services in engaging with the research communities. As a start, COAR organized a webinar yesterday with three presenters who shared their different experiences. Isabel Bernal, Spanish National Research Council | DIGITAL.CSIC: Services to Engage institutional Users. COAR recently hosted a webinar for platform providers about one of the next generation repository technologies, ResourceSync. The aim was to provide more information about the use cases and rationale for repository platforms to implement ResourceSync into their software. So far, we know that ResourceSync is already on the roadmap of many of the open source platform providers, but it is important that the benefits of adoption are widely understood. On September 4, 2018, a coalition of research funders in Europe published Plan S, an ambitious plan to accelerate Open Access in Europe. COAR welcomes the strong stance taken towards open access by a coalition of 11 European Funders, coordinated by Science Europe as outlined in Plan S and we strongly support the goal of accelerating the transition to open access. Do not restrict the vehicles for providing open access to ‘journals’ and ‘platforms’, but rather develop assessment criteria based on functions, like peer-review and other types of editorial services. Make use of the existing organized and globally connected repository network to advance Open Access and Open Science across the world. Be aware and responsive to the significant concerns in other regions and countries about the widespread adoption of the APC model. Last week, COAR participated in a training event organized by DuraSpace and CONCYTEC, the Peruvian Council for Science and Technological Information. The aim of the workshop was to help increase expertise for managing repositories at Peruvian universities and was attended by over 130 people, with another 120 people watching it on the live stream. The event was planned in order to support the Open Access Repository Law in Peru and the increasing integration in that country between repositories and CRIS systems. The program included an overview of the international context for repositories, interoperability, and next generation repositories; a hands-on training session of the DSpace platform; and an introduction to DSpace-CRIS software. The training was delivered by DuraSpace, COAR and 4Science, and will be followed up with a plan for a more active community of practive in Peru around repositories. The training took place in conjunction with a two-day conference at which COAR also had the opportunity to present our vision for the future of repositories to a large Peruvian audience. This activity reflects COAR’s increasing emphasis in capacity building for repositories internationally. Although COAR is platform agnostic, we understand that it is important to partner with the major platform providers used in different countries to ensure that we are also addressing and contributing to the local technical expertise. If you are interested in working with us to develop repository training for your country or region, please get in touch with me. On June 6, 2018 COAR held a meeting of open source repository platforms to talk about the implementation of technical recommendations in the COAR Next Generation Repositories Report. 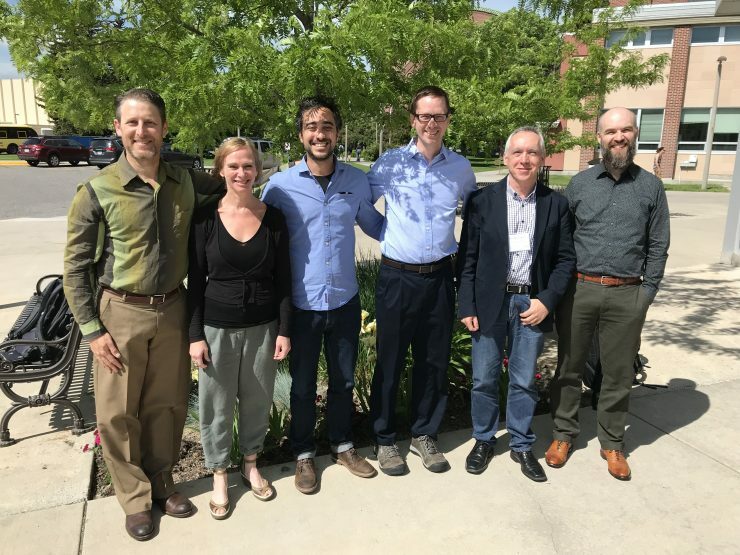 The meeting was held in conjunction with the Open Repositories Conference in Bozeman, Montana and was attended by representatives from several of the open source repository platforms: Dataverse, DSpace, EPrints, Fedora, Invenio, Islandora, and Samvera, as well as members of the COAR Next Generation Repositories Working Group. The discussion focused on two of the technologies/protocols that support many of the behaviours outlined in the report: Resource Sync and Signposting. The group talked about the use cases related to these two technologies, which include improved discovery of repository content, resource transfer, and notifications. Participants exchanged information about progress implementing these technologies, and discussed some of the technical challenges involved, especially with ResourceSync. It is clear that both additional resources, as well as greater community awareness, would help to increase the speed with which the recommendations can be adopted into repository software platforms. We also talked about how to move forward in developing more robust notification systems across repositories, allowing us to build social networking functionalities into a distributed, global network. This scenario requires the use of interoperable hubs that will collect and push notifications to and from the repositories. It was suggested we could already start with a pilot to test the technologies and begin defining the conceptual model. Help to match funds from interested organizations towards NGR technological developments in the different platforms. The meeting was very productive and COAR will follow-up on to support the adoption of next generation repository functionalities. COAR and DuraSpace are pleased to announce the launch of a collaborative partnership. DuraSpace stewards two of the most widely adopted open source repositories, DSpace and Fedora, which manage research, scholarly, and other published content in a digital repository, focusing on long-term storage, access, and preservation. DuraSpace develops global, strategic collaborations to sustain DSpace and Fedora, and VIVO, a semantic web platform that enables research discovery to create an integrated record of the scholarly work of an organization. More than 2,000 institutions use and help develop open source software in partnership with DuraSpace. COAR is a membership organization with over 130 members and partners from 40 countries on all 5 continents. COAR’s vision is a global knowledge commons based on the distributed repository network, on which value added services can be built. COAR is platform agnostic and is committed to working with all organizations that share common principles and shared goals. COAR and Queen’s University Library were very keen to participate in the launch of this journal as it offers a model of overlay services on top of repositories, a model that could eventually be generalized beyond arXiv. “This aligns really well with our vision for next generation repositories”, says Kathleen Shearer, executive director of the Confederation of Open Access Repositories (COAR), “on top of which we can build services such as peer review”. According to the journal’s founder, Timothy Gowers, research professor at the University of Cambridge, ‘Advances in Combinatorics’ was created in order to “give people the option… to submit to a journal that is not complicit in a system that uses its monopoly power to ruthlessly squeeze library budgets”. The extreme profit seeking of some of the commercial publishers (it has been reported that Elsevier made profits of approximately $1.2 billion US dollars in 2017) is stretching library budgets to the limit. In addition, it has created significant barriers in access to research and -with the advent of article processing charges (APCs)- it is exacerbating inequalities in researchers’ ability to publish. The journal plans to set a high bar for acceptance. Currently there are no non-commercial publishing venues that cater for combinatorics articles at the level envisaged. The aim is to offer an ethical alternative by launching a journal that publishes high quality papers, but does not charge publishing fees or for subscriptions. Last week, the COAR Annual Meeting took place from May 14-17, 2018 in Hamburg, Germany. The meeting was filled to capacity and, with representatives from 30 countries, was the most diverse COAR meeting to date. It offered an opportunity for COAR to take stock of the current status of the work being done to build a global knowledge commons through strengthening and connecting next generation repositories across the world. Meeting participants were taken on a (virtual) world tour of the open science landscape from Australia – through South Africa, Ethiopia and Sudan – to the European Union and Russia – through the nine Latin American countries participating in LA Referencia – through Canada and the US – and to Asia via China, South Korea and Japan. While there is significant diversity in approaches across these regions and countries, we also share much in common and have many similar challenges. The critical components for building the knowledge commons were discussed intensively. In particular, the issue of how we can reflect local needs while still supporting the global nature of research through a distributed, networked system. Efforts are progressing towards the widespread adoption of next generation repositories and there is significant interest by the repository platforms to implement the technological recommendations, as well as the national and regional networks to support new functionality that will enable social networking, annotation and peer review and common usage statistics across our systems. It was agreed that we need to support the adoption of common standards, data sharing, and strengthening communities of practice at the local, national and regional levels. Breaking down geographical silos will be critical for the commons, but there are other silos that need to be addressed as well. We envision an integrated, international ecosystem that bridges the disparate worlds of data, publications, and other valuable research outputs. In his opening talk, Klaus Tochtermann, Director of ZBW Leibniz Information Center for Economics, discussed the intersections between the COAR next generation repositories concept and another parallel effort in Europe to build an Open Science Cloud. He pointed out that while our principles and aims are very well aligned, there has not been much interaction between these two initiatives and we need to develop better ways to engage. Working together on the implementation of the FAIR principles may offer just such an opportunity. As we aim to define the technological requirements for the knowledge commons, we are also aware that the social aspects are extremely important and present us with a grand challenge. Jean-Claude Guedon, Professor at the Université de Montreal and respected open access advocate, urged us to consider two important principles within our repository network: intellectual proximity and problem solving complementarity. These principles will act as the social glue to tie our repositories together and only when we adhere to these principles, he says, can we offer a viable option for the research community. Demonstrating this value to research communities and supporting intellectual dialogue on top of our collective content will be a priority for us in the coming years. During the meeting, there was an announcement about the Swedish consortium, BIBSAM’s move to cancel their national license for access to Elsevier journals. This came as a striking reminder of why we are building a knowledge commons. Journal prices are at an all-time high, and the large commercial publishers have little incentive to innovate. This has created an extremely flawed system that is propped up through our over reliance on journal based impact measures to evaluate research, measures that are in large part defined and controlled by the commercial publishers themselves. Is it time to radically reimagine the system so that it better serves the academy and our societies? At the organizational level, I am pleased to announce a new and expanded Executive Board that was elected during our General Assembly. Four members will remain for a second term, providing continuity from previous years, while four new members will bring us fresh perspectives and wider regional representation. There are now board members from Africa, Asia, Europe, North America and South America. I left this meeting with renewed energy and great enthusiasm for pursuing the many great ideas that surfaced during our discussions. Thanks again to the COAR community for their engagement and participation, and to our partners for their financial and organizational support: Leibniz Information Centre for Economics, Food and Agriculture Organization of the United Nations, Global Open Data for Agriculture and Nutrition, OpenAIRE, SPARC NA and the University of Alberta Libraries. All the presentations are now available on the COAR website. For the photos from the Annual Meeting, please click here. The recording and the slides from today’s webinar entitled Open Access in the global South: Perspectives from the Open and Collaborative Science in Development Network are now available on Zenodo. Prof. Leslie Chan shared key lessons from OCSDNet which is a research network with scientists, development practitioners, community members and activists from 26 countries in Latin America, Africa, the Middle East and Asia. Based on OCS experience, he questioned openness and public good, discussed open science definition beyond academy. Prof Chan also highlighted that principles as in the definition of Next Generation Repository should be guiding the technology and the infrastructures, not the other way around.